His career in alcohol began with shaking cocktails in the seventies, before a few years as a sommelier. In the eighties he returned to Bar Management, in Guernsey, while studying for the WSET Diploma. At this stage his relationship with the demon drink was such that he was spending more money on books about it than on wine itself. He worked for Oddbins across the North of England and Scotland for many years, before coming to London as the Fine Wine Manager for the City. In this role he started to do many more tastings and found that he enjoyed them very much. In the meantime he had been lucky to get places on study tours to Chile, Australia, Portugal, Italy and most of the French wine producing areas. 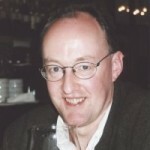 In 2002 Colin formed his own company to concentrate on Tastings, presenting, and teaching Wine courses for the Wine Education Service and for the Bishopsgate Institute. Colin has a relaxed and witty presentational style. He wants people who attend his events and courses to rediscover their sense of taste and smell and to learn some of the joys of the complex but simple subject of wine – the most wonderful agricultural product on the planet. Thank you, your question has been sent. Please enter a description of your event. Is there is anything else you would like us to know?